Spiced rump served with garlic cream coated broccoli & crispy potato chips on the side. Potato chips: Cut off the ends, then cut them into 1cm slices lengthways and cut those slices into 1cm chips. Place the chips on a tin foil lined baking tray. Drizzle with olive oil, season with salt and pepper, mix and then spread in a single layer. Roast for 25 minutes, until golden and cooked. Rump steak:Place a dry pan on high heat. Rub both sides of each steak with olive oil, coat with the Sunrise Spice Blend and season with salt and pepper. When the pan is hot, add the steaks. Sear for 1-1½ minutes a side, only turning them once, for a medium-rare steak. In the last minute of cooking, melt a knob of butter in the pan and spoon over the steak. Remove, set aside and keep warm. If you would like to rest the steak, cover in tin foil and rest for up to 5 minutes. Saucy broccoli: Using the same pan on medium-high heat, add the onion with a pinch of salt and a splash of water to deglaze the pan. Cook the onion for 5 minutes then add the broccoli. Sauté for a minute, then add the garlic, sour cream and water (4 tbsp for 4; 2 tbsp for 2). Cook for another 3-4 minutes until the broccoli is bright green and cooked but with a slight bite. Season with salt and pepper to taste. 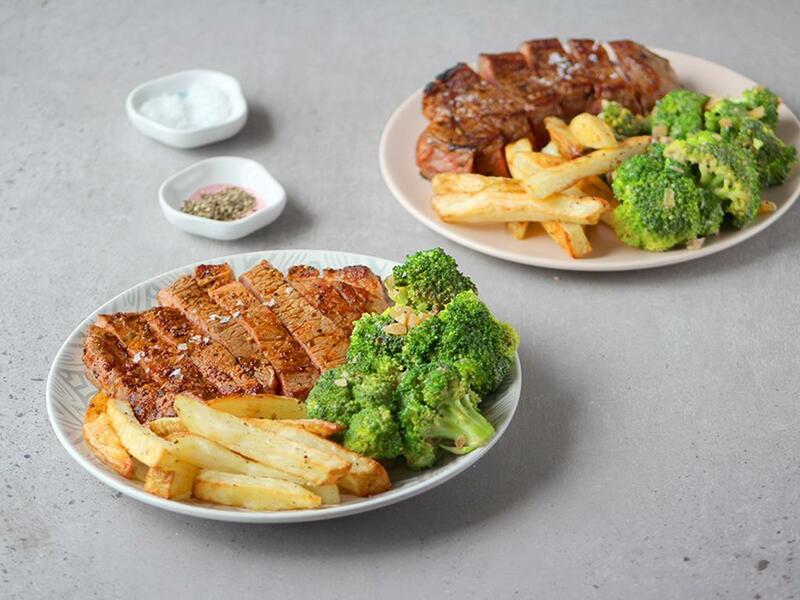 Serve the rump steak with the saucy broccoli and potato chips on the side.